Yesterday we revealed plans that T-Mobile is planning on launching a brand new prepaid MVNO (Mobile Virtual Network Operator) as soon as next week. This new prepaid carrier will work exclusively on T-Mobile’s service and is being aimed directly at the Hispanic market. Univision – of course – is already a very well-known brand among the Hispanic community, and one which T-Mobile can leverage to gain a foothold. While we knew the carrier was going to be launched yesterday, we knew very little about the plans or what Univision Mobile is going to offer. Thankfully, now we do. 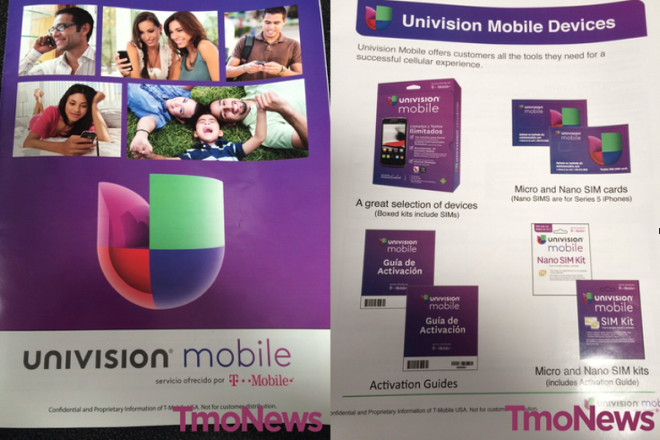 Univision Mobile will sell a selection of devices as well as SIM packs to run on its prepaid plans. They’ll have regular SIMs, Micro and Nano SIMs available for sale to maximize device compatibility. The intention is to launch three separate plans, dubbed A, B and C in some internal paperwork we’ve managed to get our hands on. Plan A offers Unlimited Nationwide Talk and Text. Users will get unlimited minutes, texts and picture messages within the US. Plan B offers the same, plus unlimited data, with 2.5GB data at 3G speeds and dropping down to EDGE/2G once that barrier is hit. Also, Plan B subscribers will get unlimited access to Music-Uforia (data used with this service will NOT be counted towards the 2.5GB 3G data limit). Lastly, plan C offers the same as the others, except users will get 2.5GB of 4G data, and a bonus 2.5GB of 4G Uvideos data. 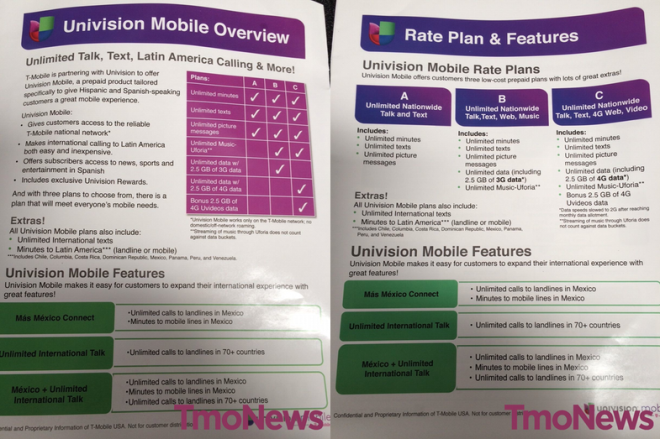 Each Univision Mobile plan will also come with unlimited international texts, and will come with minutes (landline or mobile) to Latin American countries. Those include Chile, Columbia, Costa Rica, Dominican Republic, Mexico, Panama, Peru and Venezuela. As well as that, you’ll get unlimited calls to landlines in 70+ international countries. Interestingly, the internal documents make a distinction between “unlimited” and “minutes” when differentiating between landlines and mobiles in Mexico, as well as Latin American countries. One presumes that’s because when plans are made public, they’ll have a set number of minutes included for those calls. At the moment, we still have no specifics on pricing, or which devices are going to be available on the new prepaid MVNO. But, it’s happening, and it’s happening very soon. Pretty much the same as their international talk and text add on option. It’s Colombia in the native spelling. In the same way Italia and España are Italy and Spain… Columbia is the English spelling. Ummm, no? It’s Colombia…. In English, Spanish and in any other language. End of story. Please look up your English encyclopedia so you could see yourself. No stupid it’s Colombia learn 2 reed. Doesn’t tmobiles telcel America already offer the same thing? Unlimited calls n txts to Latin america.. They dropped the unlimited to Mexico about 6 months after launch. It’s Colombia , not Columbia..
Its ridiculous how many people continue to spell it wrong….Copa mundial here we come!!! 24 days left until curramba!!!! It would of been less complicated if you had said PABLO ESCOBAR my friend..